How’s That Sacrifice Coming Along? It’s been one month ago since we discussed goals and resolutions for 2017. So the big question is: How are you doing on those goals and resolutions? My answer is “some good and some not so good.” I realized that I am doing very well on the goals that I enjoy. I’m not doing so well on the goals that I really dislike (I would rather use “hate” but that’s a little strong) and need to be following the most. They involve exercise and healthy eating. I get so mad at myself every time I think about how stagnant I am for weight loss and exercise goals. It’s not because I don’t have time to exercise or eat healthier… it’s because I’m not committed to it. I think – “tomorrow. I’ll start tomorrow.” Then tomorrow comes and I look for another reason to start tomorrow. We went to Dancing With The Stars tour in Indianapolis on Sunday. It was soooo good. We love watching the talent and creativity of these dancers. Each dancer had a short video about themselves telling how they started dancing and their journey to DWTS tour. All of them started very young and have stayed committed for years to dancing, exercising and, as their body shows, healthy eating. I realized I have not been committed. In order to commit, you have to sacrifice. In their cases some of them sacrificed “normal” school functions because they were home schooled. No prom. No homecoming. Some of their families sacrificed all the money they had to make their child’s dream come true. Some of them even sacrificed their family to move across the world to have a better opportunity. True, true sacrifice. If you haven’t succeeded in your goals or need a do-over, it’s okay. It’s okay to start over and it’s okay to not enjoy every step of the way because that’s what commitment and sacrifice are all about. If you loved every minute of the task, it wouldn’t be a sacrifice. How bad do I want a healthier, thinner body? How much do I want to sacrifice? Jesus sacrificed His life for us. He did nothing wrong. Yet He was beaten, mocked, spit upon and stabbed. That puts the word sacrifice back into perspective for me. He did that and I can’t sacrifice a few days a week and some chocolate!! WOW!! What’s heavy on your heart or mind today that you know you need to be more committed to but haven’t made that last leap of faith to sacrifice? Do it today. Grab hold of my hand and let’s take this leap of faith; this step of sacrifice together! One…Two…Three…Go! This entry was posted in devotional, inspirational, motivational, spiritual on January 31, 2017 by Deanna Young. Today is my little sister’s birthday. She is 48. She now makes her home in heaven. Yesterday my husband and I delivered 353 buckets to Cincinnati Children’s Hospital in memory of Christina’s birthday. for your generous donations and filling ALL of these buckets. Thank you, Anna at Cincinnati Children’s Hospital. You are amazing! Bucket Buddies Mission was created in honor of Christina and continues in her memory today making a difference to children all across North America by giving buckets of goodies to those children suffering from cancer and other illnesses. Happy Birthday, Chris. I hope we continue to make you proud as we near the 5,000th bucket delivered across the US and Canada. 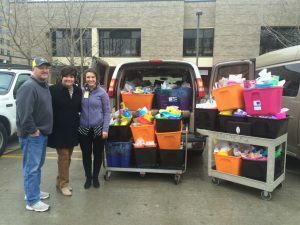 Deanna and Roger delivered buckets to Cincinnati Children’s Hospital in memory of Christina’s birthday. This entry was posted on January 27, 2017 with tags: #makeadifferenceeveryday by Deanna Young. My friend, Sarah was so excited to give her gifts to her friends because she hand-picked the gifts carefully based on her friends’ likes and what they were good at. Sarah gave Friend A her gift of scrapbooking materials; great stickers, beautiful pages and elaborate embellishments. Friend A was one of the best at scrapbooking. Sarah gave Friend B her gift of a beautiful, top-of-the-line, jogging suit because Friend B loved to run and was very competitive with many awards to show for her hard work. Friend A didn’t really like exercising at all and Friend B was not crafty in the least. WHAT? …….now this is a hypothetical story. But let’s look at it. Sarah chose gifts specifically for the friends based on what they were good at and what they enjoyed. Even though Friend B was good at running and disliked crafting she wanted what Friend A had because she saw how well Friend A created beautiful things from her gift. Sometimes we are just as disrespectful to God when He gives us something and we snub our nose, look to our neighbor’s gift and say “no thanks, God. I would rather have what he has.” God gives us spiritual gifts based on His evaluation of us looking at what we’re good at and what we enjoy and for where He knows we will excel. We need to stop wishing we could sing like so and so and be thankful we have the skill and creativity to work with children. We need to stop wishing we could preach like Franklin Graham or speak like Sheila Walsh and be thankful we have the skill to play the piano or teach Sunday School. Whatever your spiritual gift is, use it for the glory of the Lord and stop wishing you had a different gift. God picked out your gift based on your heart, your talent and your strive for excellence. Don’t try to return it or trade it for someone else’s because you’ll never get it back. He shops where there are no exchanges and no returns. Take your gift and use it to make the Giver proud. 2 Corinthians 9;15 – Thanks be to God for His indescribable gift! This entry was posted in devotional, inspirational, motivational, spiritual on January 25, 2017 by Deanna Young. The object of the game is to get the opponent’s king in an “inescapable threat of capture” – meaning the opponent has nowhere to move his or her king that it can’t be taken by the other player. When that happens, the opponent calls “Checkmate”. Game over. Some days we just want to give in because it seems too hard to fight anymore. We’re tired physically or emotionally, mentally or spiritually. We start feeling sorry for ourselves. We whine and complain and wonder why others have it easier than us. It’s just not fair. When you fall into the “woe is me”, “why can’t I get a break”, “I’m just so tired”, “I’m gonna do it my way because it makes me feel better” mode, then the devil has you right where he wants you. But, my friend, you are NOT in a Checkmate. We will not dare let the devil win this battle of feeling sorry for ourselves and being selfish and making it “all about me. ” When you get down and feel the devil yelling “checkmate”, you pull out the bigger King …..”you yell JESUS”. And then my friend…GAME IS OVER! We win! Every time! This entry was posted on January 24, 2017 with tags: the game of chess by Deanna Young.